Toronto, ON: Puffin Canada, 2008. Peary, Robert E. (Robert Edwin), 18561920-Juvenile fiction. Bartlett, Robert A. (Robert Abram)-1875-1946-Juvenile fiction. Henson, Matthew Alexander, 1866-1955-Juvenile fiction. I could hear the dogs barking more clearly now. They always barked a lot, but there was something different this time. I went to step outside but stopped myself. First I reached over and took one of the rifles that was leaning against the wall. The metal of the barrel felt freezing against my skin. I hadn't put gloves on. Maybe I should go back to my bunk and get them or – the dogs were barking louder, almost frantically. I stepped outside and pulled the door closed behind me. It was dark – it was always dark – but it was brighter than inside. The moon was big and bright and gave off enough light to allow me to clearly see the shelter across from us. I circled around the side of the shelter to where the dogs were kept and – I stopped dead in my tracks. There was a polar bear – a gigantic polar bear—standing beside one of the igloos! Eric Walters is a classic storyteller. His award-winning novels are smooth, clean reads that put ordinary kids in extraordinary situations. The Pole is no exception. Fourteen-year-old Danny, an orphan from Newfoundland, boards the Roosevelt in New York City in the summer of 1908 as a mere deckhand, and, by the time the ship arrives in the Inuit village of Etah, he is a valued member of Captain Bartlett's crew. Danny is honest, hardworking and eager to learn. His skill with the sled dogs catches the eye of Commander Peary who allows him to join the final assault on the North, an honour shared by a select few. On the surface, The Pole is a traditional boys' adventure story, complete with harsh conditions, polar bears, near-drownings and dogsled racing. The action sequences are breathless and exciting. What sets The Pole apart is that, between the action, Walters manages to delve into themes of tolerance, loyalty, justice, and honour, giving The Pole a depth that many adventure stories lack. 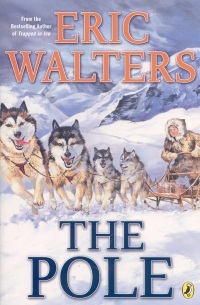 That Walters never rests on stock characters or stereotypes results in an interesting, well rounded cast of characters, including Commander Peary, an explorer who quotes Shakespeare, Matthew Henson, a young black scholar with invaluable experience in the North who teaches Danny to speak Inuktitut, and Danny, himself, who is an extremely likable narrator. During his adventure, Danny learns some hard lessons about justice. He is bothered by how some of the men, including the Commander, treat Matt due to his skin colour. He is also surprised that many of the men don't bother to learn Inuktitut, the language of the Inuit men (referred to as Eskimos in the book) who are assisting them on their travels and keeping them from perishing in the harsh Northern climate. Although he and Matt reach the pole before Commander Peary, the Commander is clear that it will be his name, and his name alone, that will be recorded as the first man to reach the pole. Following the story, Walters includes an author's note, paying homage to the bravery of men like Matthew Henson, Captain Bartlett and the Inuit members of Peary's expedition who likely reached the pole before Peary, himself, but due to their social and racial status in 1909, have been left out of the history books. Walters does an excellent job providing a well-researched historical adventure while, at the same time, breathing new life into the survival story. In a sea of vampire books, The Pole is a refreshing adventure story just in time for the winter reading season. Vikki VanSickle, who has an MA in Children's Literature from the University of British Columbia, is a writer and manager of the Flying Dragon Bookshop in Toronto, ON.